This time I would like to share a super simple, but at the same time, very delicious recipe for a watermelon salad with crisp pumpkin seeds and feta cheese. 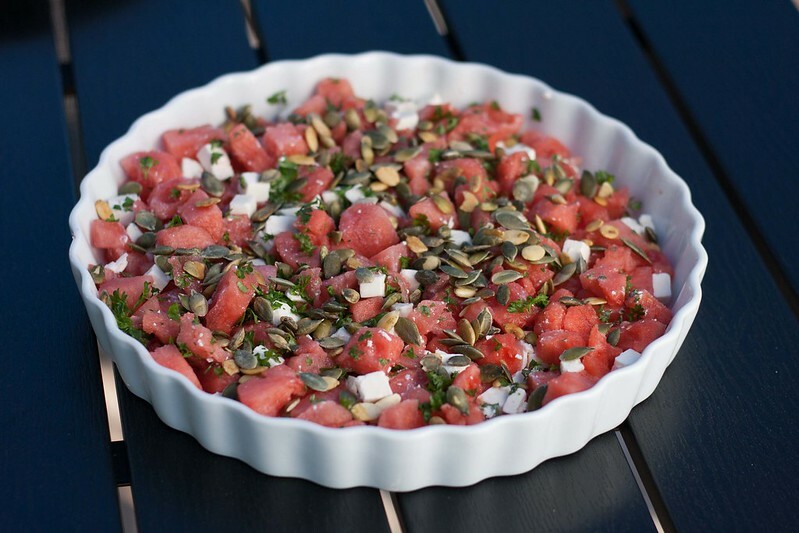 I typically make and serve this watermelon salad when I am having a barbecue party – I think it is because it is a very summer-like salad and therefore is perfect for an outdoor barbecue. However, of course it is a great salad all year round and it goes perfect with most meat. I am always ending up making this salad when I have bought a too large watermelon for my afternoon fruit snack. Then I always save half the watermelon for the day after and then I make this melon salad. As said, this salad is super easy to make. You simply just cut the fresh watermelon into smaller cubes and mix it with some lightly dry-fried pumpkin seeds and feta cheese. Decorate the salad in a flat salad dish and if you like, add some chopped parsley on the top – it is that simple to make this delicious salad. 1. Open up the watermelon, remove the seeds and dice the watermelon meat. 2. Dice the feta cheese. 3. Roast the pumpkin seeds on a dry and hot frying pan. Roast for a couple of minutes. 4. On a nice salad plate; mix the diced watermelon and feta cheese. Sprinkle the top of the salad with the roasted pumpkin seeds and some freshly chopped parsley.